We love profiling stunning restaurants from around the world, but it’s pretty special when we find one in our own backyard. Tucked away in the Grand Rapids north Monroe industrial district, you’ll find the unpretentious yet sophisticated Gray Skies Distillery. Gray Skies Distillery is a small batch distillery known for their unique whiskey, gin, and vodka. 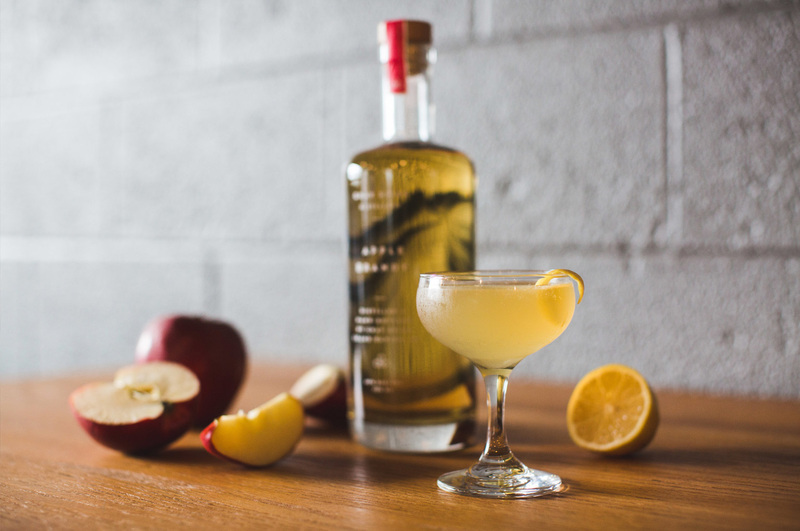 Along with their 13,000 square foot production facility, they also offer a tasting room where guests can sip a wide array of inventive and flavorful cocktails. It’s the kind of place where guests chat with the bartenders about the latest batch and drinks are served in coupes and snifters with fun garnishes. Owners Steve Vander Pol and Brandon Voorhees started Gray Skies back in 2014. At the time, Vander Pol, a Michigan native, was residing in Denver. Inspired by the thriving distillery scene in Colorado, he knew that he and Vorhees could bring the craft cocktail perspective back to Beer City, USA. “We knew that Grand Rapids residents already appreciated craft beer, so we were confident small batch spirits would resonate with the city, too,” says Vander Pol. So, Vander Pol packed up, moved back to Michigan, and together they set up shop on 700 Ottawa Avenue. “In the beginning, we had a shoestring budget for the tasting room design. Our energy and resources were spent perfecting the production side. The original tasting room was basically thrifted furniture from garage sales and Goodwill. It matched the ethos and hustle at the time, but now, it’s great to see it transform into a welcoming, more sophisticated space today,” says Vander Pol. Designed by himself and co-founder Vorhees, the newly renovated tasting room is a far cry from the original. It brims with modern industrial sophistication yet still maintains that approachable and casual atmosphere Gray Skies is known for. 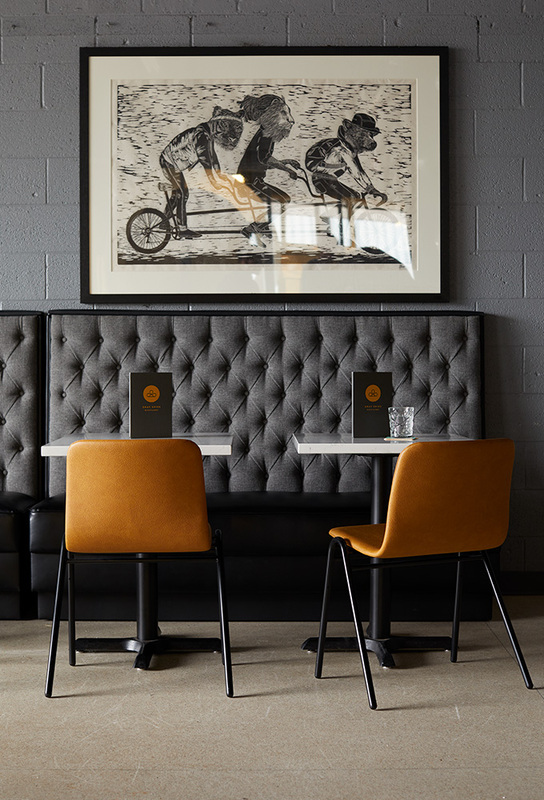 To achieve a hand-built, time-worn space, they chose luxe materials, upholstered booths, and a neutral yet rich color palette of rust, grays, whites, and black. 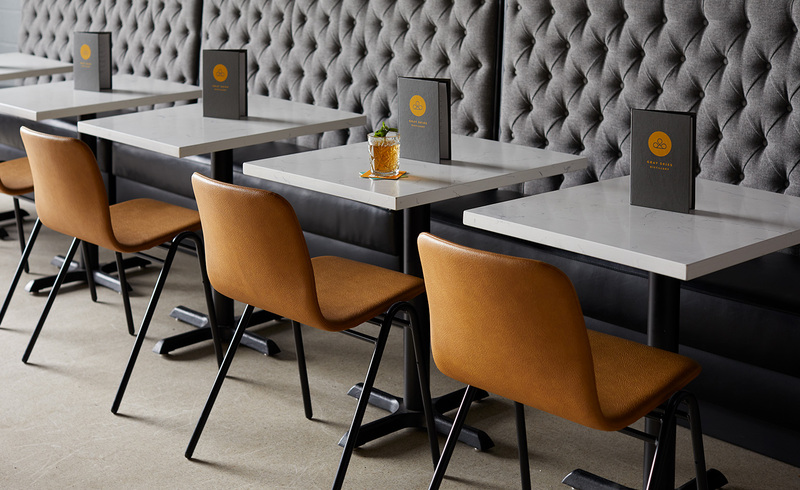 Rich camel-colored leather Harper Barstools and Chairs line the bar and dining space. The leather adds a cozy, lived-in feel while the quartz pedestal tables and mid-century-inspired Andy Table keep things sleek. An additional lounge space, complete with the mid-century leather couch from the original tasting room, offers even more casual seating. It’s the perfect place for intimate dates or happy hour with friends. “We wanted the new space to feel intentional and hand-built—similar to our spirits. That’s why we opted for a mid-century feel and the Harper shell chairs,” says Vander Pol. Ultimately, Vander Pol and Vorhees wanted a space that reflected the quality, hand-crafted cocktails they serve. 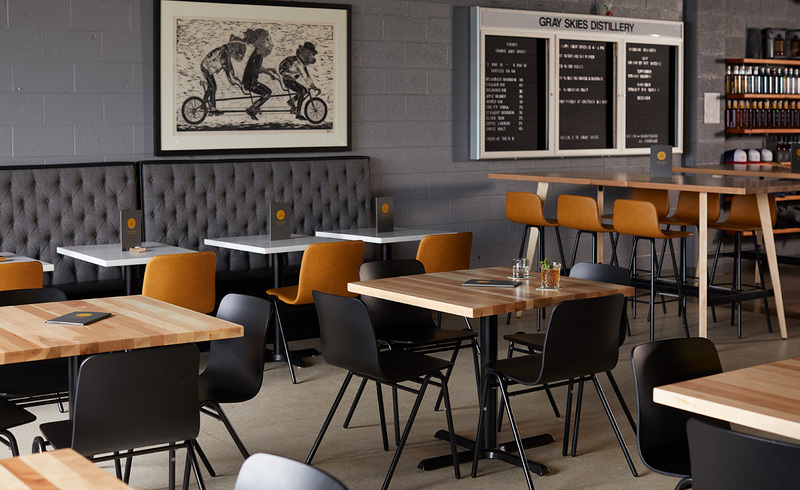 It’s a space that’s comfortable, original, and the perfect addition to the Grand Rapids craft beverage scene. So, if you find yourself in Grand Rapids looking for the perfect cocktail, you know the place. Vorhees suggests trying their straight bourbon whiskey. It's the reason they started Gray Skies. But if you ask me, I suggest anything with their gin (it's not too piney and incredibly refreshing). But if you can’t get here (but you really should), you can take Gray Skies home. Look for Gray Skies at your local grocery store and follow these recipes to create one of their signature cocktails. Cheers!